Last month’s unseasonably warm weather has had me looking forward the 2010 farmers’ market season. While cautious in my own gardening habits – I did not plant early lettuce, beans, peas, radishes etc… – I have been patiently waiting for the arrival of fresh spring vegetables after a winter’s worth of rather tired greens, canned tomatoes and heavy root veggies. A great thing about Ottawa is that many neighbourhoods within the City’s urban core are well-served by farmers’ markets (Parkdale/West Wellington, Mainstreet/Old Ottawa South, the Glebe). 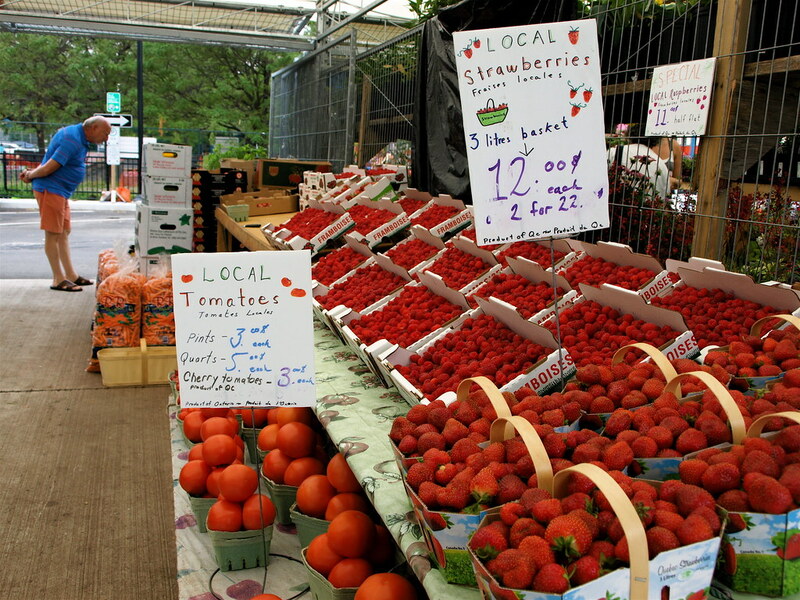 These markets offer opportunities to buy fresh produce, often grown by people within the Ottawa valley. However, recent debate over the “value” of one of the City’s markets – the Ottawa’s Farmers’ Market located in Parking Lot #4 of Lansdowne Park – raises some questions about just exactly how the City sees / understands the role of the farmer’s market in the modern city. Specifically, recent staff reports and Council decisions heavily emphasize the economic role of the farmers’ market rather than broadly interpreting the market as a public good. Based on the report, two things struck me as indicative of how the City understands its farmers’ markets. First is the emphasis on the rural aspect of the market and the primary role of the food producer within the market structure. The mandate for the market was issued out of the 2005 Rural Summit and issues relating to the market are decided and debated in the Rural Affairs Committee. In addition, a draft report on the Ottawa Farmers’ Market obtained by the Ottawa Citizen reinforces this rural mindset, suggesting that the market be limited to “local farmer-producers” and recommending that other vendors (e.g. bakeries, prepared food vendors) be shifted off the immediately subsidized site so as not to “dilute the vision and take the market away from the expressed goals and objectives of helping farmers in the region sell food products to urban Ottawa residents.” While there clearly would be no market without food producers, not all food production must necessarily happen in rural areas – witness the rise of spin farming and market garden plots within urban areas. Also, this line of reasoning neglects new connections between food producers and home-based food processors (baked goods, canned goods etc…) that are starting to populate market stalls (e.g. Pascale’s Ice Cream and the Piggy Market stall). In short, casting food production as solely a rural issue obscures the work of urban-based producers. Second, as described in the staff report and also reported in the Citizen, the main factor in the decision to extend the subsidized lease at Lansdowne was the question of the overall economic value of the farmers’ market. This issue of value was framed principally around whether the market continued to benefit “local industry” and whether there was a “burden” on City taxpayers to subsidize a successful enterprise. This focus on the economic benefit and burden of the market is focused on two particular groups of people – those who sell at the market and taxpayers generally. There is surprisingly little consideration for those people who shop, socialize and learn things about food at the market. What is missing from this debate is a broader discussion about the overall contribution of the market in terms of building a more livable city. In the case at Lansdowne, there was no consideration of how the farmers’ market does a remarkably good job of enlivening an otherwise dead space – a parking lot – and how the market provides other forms of public goods, namely safe, healthy food and environmental education opportunities (learning more about nature/environment and processes of food production). By providing a subsidy to vendors in the form of low rent, the City is not just supporting local economies and allowing farmers to sell locally (stated objectives of the project), but also providing a space for public interaction, enabling environmental education, creating new connections between rural producers, home-based food preparation businesses and consumers, and finding ways outside of the traditional agri-busisness model to bring food into the city. The success of the Ottawa Farmers’ Market, or any other farmers’ market in the City, should therefore not be judged solely by its economic viability, but rather by how it contributes to the overall fabric of the city. Farmers’ markets could be an important tool for many other City departments (public health, environment and recreation) and there should be a way to broaden the discussion about the overall impact of farmers’ markets in Ottawa in terms of how they contribute to the project of city-building. The discussion about farmers’ markets within the City of Ottawa is not over with the start of a new market season. Additional reports on the issue of the Ottawa Farmers’ Market are anticipated later this year as is a decision about the plans for the future of Lansdowne park. The outcome of these issues will be instructive for understanding the City’s continued perception of the role of the farmers’ market within its urban boundaries.